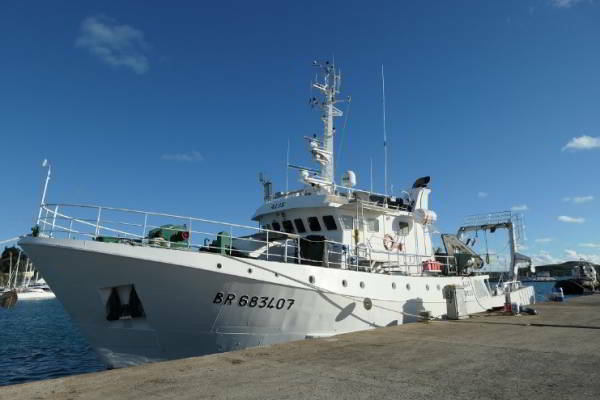 The goal of the Puffalis cruise is to characterise the ocean around Wallis and Futuna. It is a joint scientific cruise between SPC and IRD which will continue collaborating to better understand the ocean, its functioning and its inhabitantsa. The Wallalis Cruise is over and it is time for a quick assessment. The weather with strong winds and swell has completely changed the plans and did not allow us to follow our initial plan. 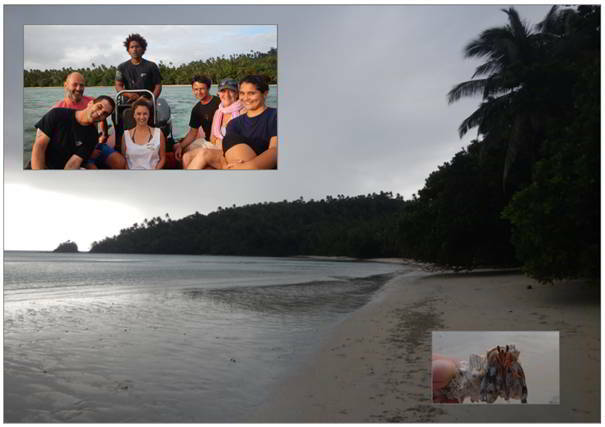 Of the 19 oceanic sampling stations planned, only 4 had been visited et 6 other sampling stations were conducted on the leeward of the island close to the coasts of Wallis and Futuna islands, the only location where we could work some days. 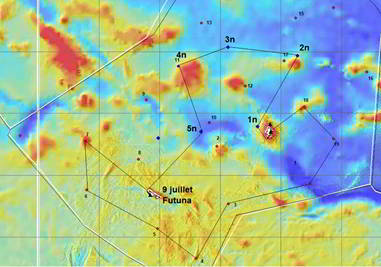 This shrunken sampling plan will limit our conclusions on the economic zone of Wallis and Futuna unfortunately. However we were still able to visit 4 seamounts including Lala Rock which is close to Wallis island and which we should be able to characterise with the data and samples collected. 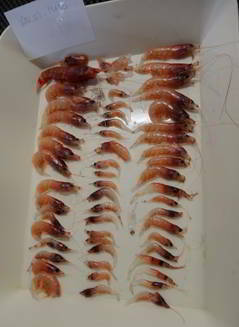 On the 10 sampling stations visited we conducted 73 experiments (15 CTD casts with water sampling, 5 TAPS casts, 7 WBAT casts, 7 zooplankton nets, 19 micronekton nets and 20 XBT probes) et we collected along the track acoustic data, currents, temperature and salinity. 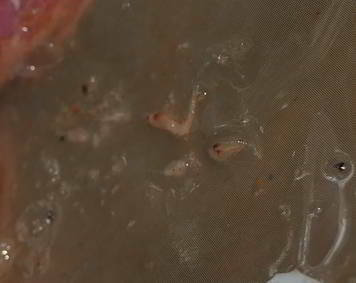 It will take us several months now to conduct the lab analyses and the data analyses. We have planned to come back to Wallis in the first 6 months of 2019 to present our results. On the human side of things, we met many extraordinary people during this campaign. We have been honoured to meet the king of Wallis, and to meet some members of the territorial assembly and the representative of the préfet. We have been warmly welcomed by the staff of the services of environment and of agriculture and fisheries who helped us during this trip. 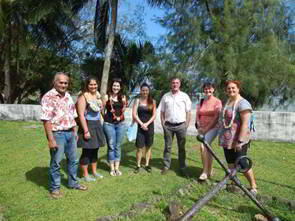 The students of Futuna and Wallis were very enthusiastic and we enjoyed discussing with them. Media also helped us disseminate our message. Last but not least, we wanted to thank to crew members of the Alis who largely contributed to a nice atmosphere onboard despite the difficulties of the weather; they demonstrated a high level of competency, flexibility and good spirit. Yesterday was very busy with all the visitors but today is also going to be very intense with a lot of work ahead of us to uninstall everything. 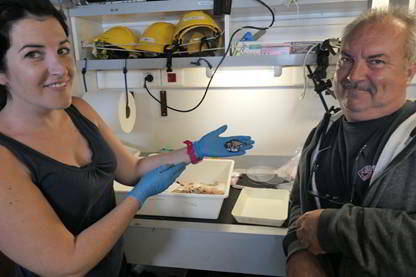 The crew and the scientists will clean and pack all the equipment from our campaign to give space to the next scientific team composed of divers. 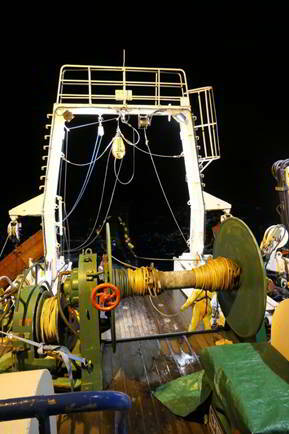 There is heavy work conducted by the crew with the removal of one of the winches and the micronecton net. Suddenly the deck seems much spacious. We disconnect and pack all the cables from the movable acoustic equipment and the filtration system from the wet lab is stored on land in a dock waiting for the French Polynesia campaigns in a month time. 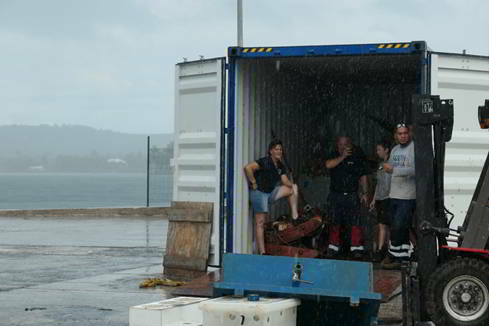 Everything is labelled and packed in boxes and some boxes are loaded in a container that is going back to Noumea. We were lucky with the weather until the end as a storm with heavy rain stops the work for a while. This morning, we had the visit of several classes on board, terminals S and 3ème. We had 5 activities in which they toured to explain our work on board. 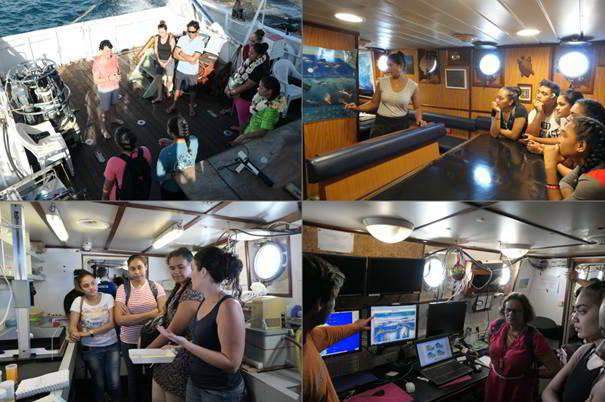 One activity was on physical instruments and phytoplankton, a workshop on micronecton, a workshop on acoustics, another on the pelagic ecosystem and a last one at the bridge where the second captain and the lieutenant explained the operation of the boat. The children seemed to appreciate. This afternoon, it was the turn of the local authorities to come and visit the boat, customary minister, staff of the agriculture and fisheries department, representative of the vice-rectorate, agents of the environment department, head of Wallis radio, representative of the Chamber of Commerce, they too seemed interested by our work. For this last day at sea, the wind has finally slightly decrease. 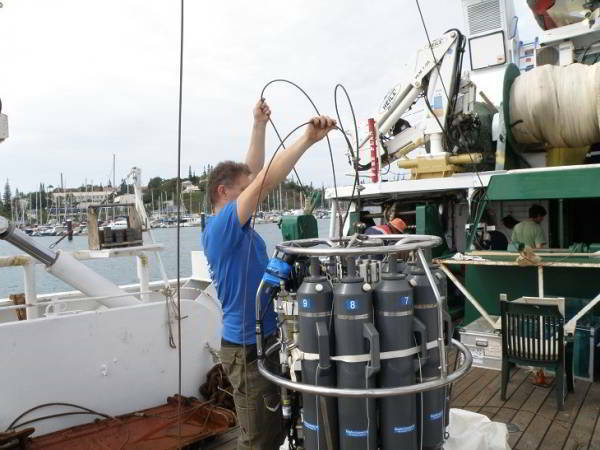 We decided to conduct a sampling station on the windward side of Wallis that we have not explored yet. The station goes well and we even see a hammerhead shark, curious, following at the back of the boat. 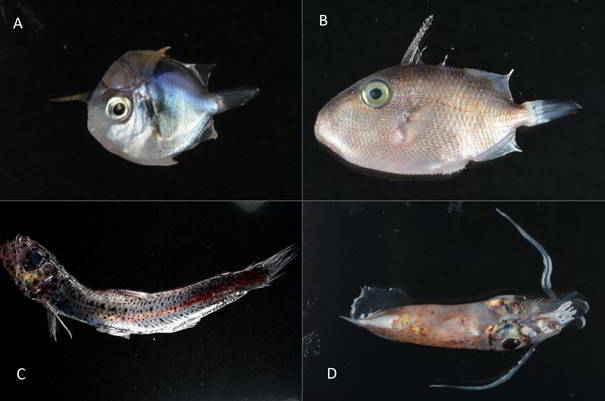 The trawl is coming back with organisms that we have not yet collected, and even a fish that we have never seen. Around 2pm, we make our way to the lagoon to find the wharf from which we left two weeks ago now. To close a beautiful mission that will have unfolded, certainly in mild weather conditions, but always in a good mood, we make an end of trip barbecue on the deck at night at the wharf. After 2 trawls on the slopes of Lala Rock that allowed us to catch interesting fish, we decide to steam southward toward the deep trench at more than 4000 m depth that we tried to explore a few days ago. We steam sideways with a wind stronger than 25 knots and it is very uncomfortable. Around 8 am, the captain decides to change route. The sea is too rough to work. Once more, we have to seek shelter on the western side of Wallis island. 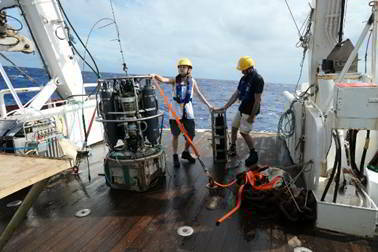 We decide to look for the fish aggregating devices (FAD) that are anchored around the island around 1000m depth. 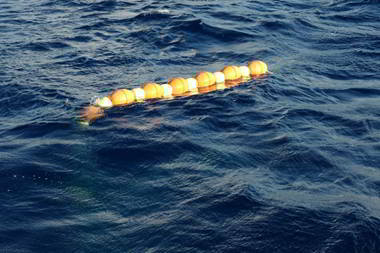 They are visible at the surface by a line of orange buoys. 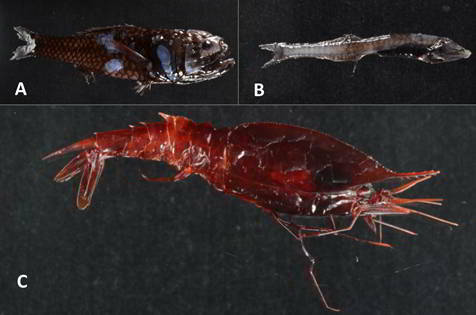 FADs are mimicking floating logs that tend to attract fish. Fishermen fishing around FADs can hope catching more easily top predators such as tuna, mahi mahi, wahoo. We cannot find the FAD that is supposed to be located in the south of the area, but we manage to find the FAD in the north-west. The acoustic indicate no activity around this FAD and we move toward the northern FAD. 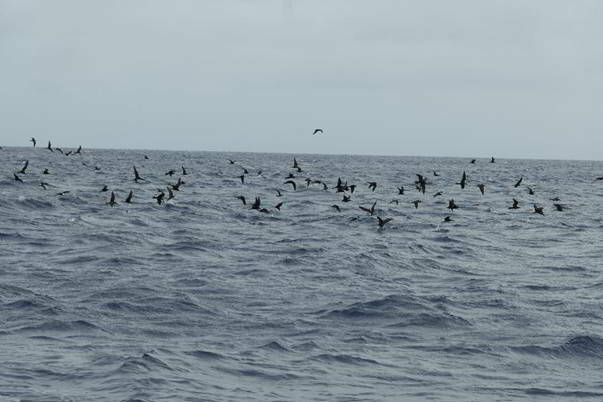 We observe some birds and some small fish around the FAD and patches visible on the acoustic sounder indicate there are fish around. This morning we left the quiet waters behind Wallis to join a seamount to the east, the Lalarock. This seamount is actually an assemblage of several peaks that rise to about twenty meters below the surface; the depth goes from about 3000 meters to 20 meters in a few kilometers, a real mountain under the sea. We know through the literature that seamounts are often conducive to the aggregation of all parts of the food web, so we wanted to confirm it for that one. After 6 hours of transit in a rough sea, we arrive by the south of the mount. 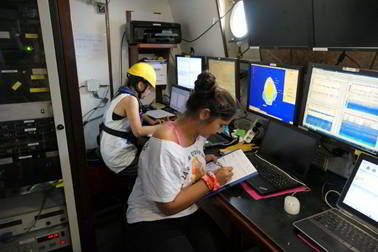 The objective is to make a first radial to better understand the complex bathymetry of the mount and to see if the rate of aggregation is different on the leeward slope and on the wind slope. 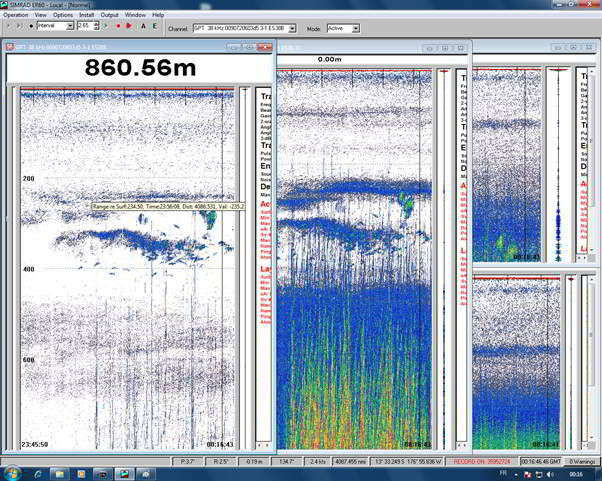 A whale group surfaces right next to the boat, and the acoustic signal is very strong on the slopes. This site seems to be a gathering place for marine life. 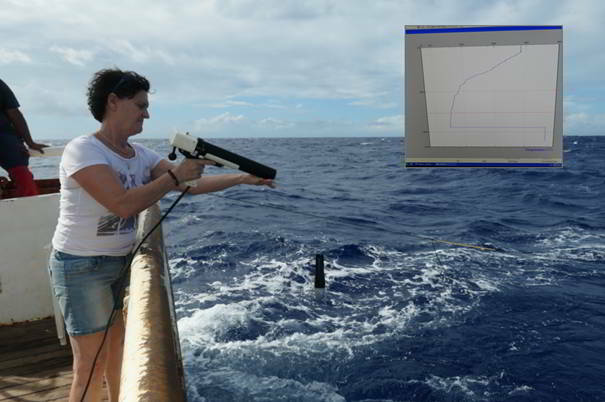 We also do shoots of Sippican XBT around the mount, this probe is pulled from the boat, goes down to 750 meters and transmits us live a vertical profile of temperature. It will also help to better understand the organization of water masses and currents around the mountain. Echogram of the Lalarock peaks. Three very different shapes can be seen: the one pointed by the finger with a crater-shaped and culminating at 400 meters, the one on the top right with a summit at 20 meters with a high density of organisms on the left and the one at the bottom showing a flat and wider top. We finished the sampling station yesterday around 9pm and we decided to steam eastward to conduct a sampling station above a trench deeper than 4000m. With a 20 knots facing wind it is very uncomfortable and t 11pm when the wind reaches 25 knots we decided to change course to seak shelter on the western coast of Wallis. We spend the day there, as as soon as we leave the leeward side of the island, the wind is too strong to allow us to work. 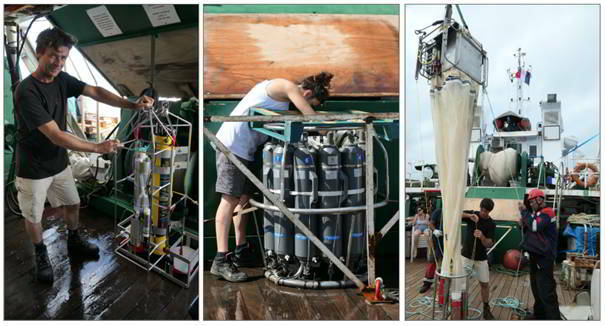 We do another station on this side of the island with a deep trawl at 500 m depth and a trawl at 200 m, a wide band echosounder (WBAT) cast and a rosette and CTD cast to establish a vertical profile down to 600m of temperature salinity and fluorescence. When we finished the sampling station last night we decided to steam to get closer to Wallis as the weather forecast is getting worst with increasing wind. We target a seamount on the way to Wallis and we reach it at mid-morning. 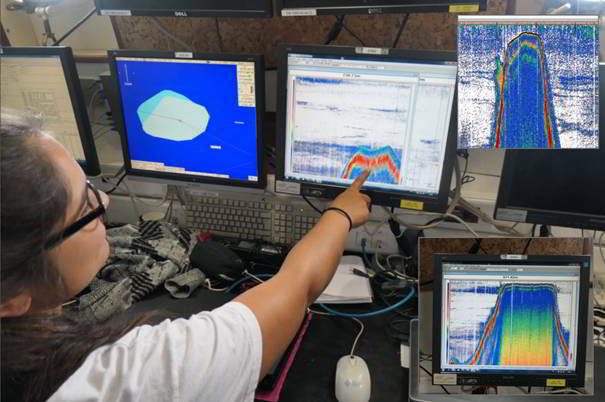 We steam over the seamount to acquire the acoustic signal; the summit is around 440 m depth, and we observe interesting detections between 300 and 400 m depth. We set the micronekton trawl but without any depth probe we don’t know where we are fishing and the net comes back empty, we missed the detection. This sampling station on the seamount is very peculiar. 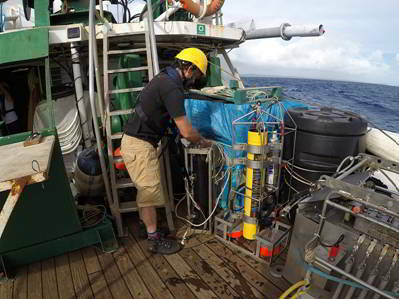 The probes on the rosette indicate a fluorescence peak, an index of the quantity of phytoplankton, at 100 m depth with the highest value measured since the beginning of the campaign. Another specific characteristic is the fact that the surface water between 0 and 85m depth is very homogeneous with a temperature at 28.2°C. Below 85m the temperature decreases, the water is at 24°C at 150m and at 6.5°C at 600 m depth. 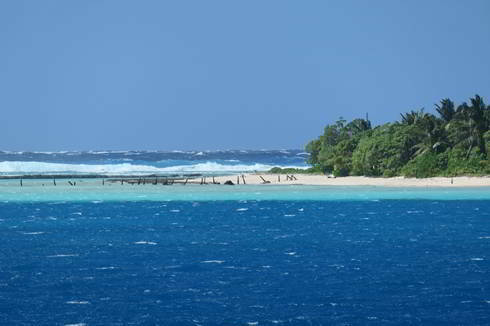 This morning 6 o'clock, the weather seems milder, so we leave our anchorage in Futuna bay towards the south of the area, full of hope. Unfortunately, around 9:30 the sea is still very rough and it is not possible to put the instruments in the water, we are very disappointed. 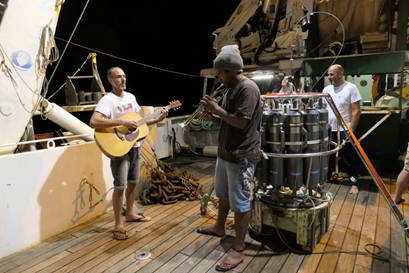 Therefore, we have to go back to Futuna and we decide to conduct a sampling station in these quieter waters. 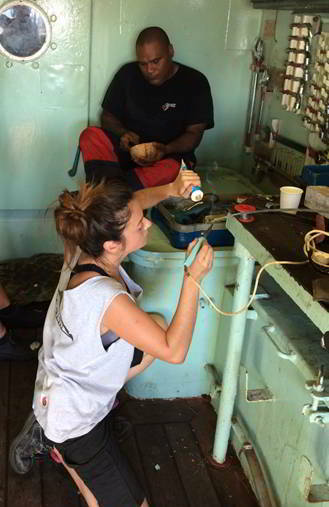 After two CTD casts, Céline, our instrumentalist, detects several weakness points in the electric cable. The cable is cut and then the splice is redone. This small break in the operations allowed us to taste good coconuts offered by the family of a Futunien crewmember who had the joy of meeting his family last night. 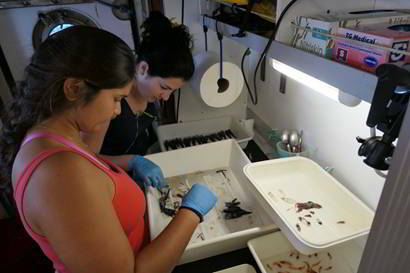 Then the station resumed with two trawls, the WBAT, two zooplankton nets and the TAPS. We left the anchorage this morning to join Futuna. We lower down the dinghy in the water but the swell is too big for us to jump onboard safely. We decide to wait for the agreement of the pilot to enter the bay and we are lucky to see very close to the boat a small whale, probably a small rorqual. In much calmer waters, we leave the vessel in the dinghy and are welcome by a representative of the fisheries services who drives the whole scientific team to the Sisia high school. The director of the school, the biology teacher and an entire class of 15-16 year old students are waiting for us and during about 1h30 we are presenting our work and discuss with them about our project. 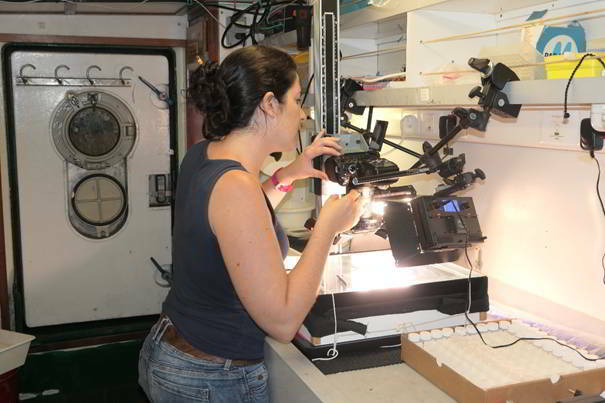 We are showing a small movie about the work onboard, probes, a poster on the life in the ocean, the work on phytoplankton and acoustics and we have brought some specimens of fish and crustaceans, caught during the previous days, they are examining with a microscope. The students are very enthusiastic and interested. A TV crew from Wallis and Futuna 1ere is following us and interviews the students and the scientists; it will be reported on the radio at lunchtime and later in the evening on television. The representative of the fisheries services is then taking us to visit the representative of the French state at his office. We are presenting our project and discuss with him for about an hour. We conducted our first sampling station at night and it started around 2am with 2 micronekton net tows in the first 100 meters from the surface where all the deep organisms gather at night. 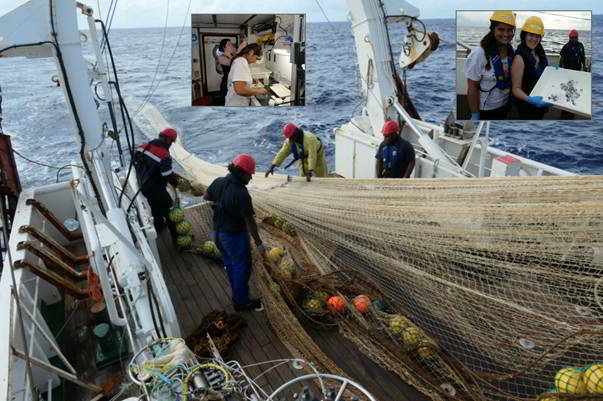 The content of the nets is not very rich but we caught some interesting specimens and a large squid. 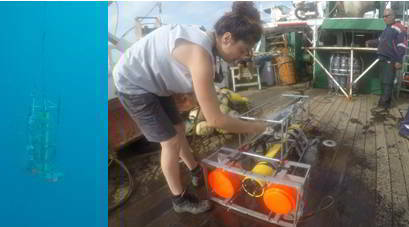 We then conduct a WBAT, wide-band acoustic sounder cast and a first rosette cast to establish the temperature/salinity profile and to collect water. However, the wind is picking up and the sea is getting rough. For safety reasons for the crew, and to avoid breaking our equipment we decide to stop working. We then steam towards Futuna, facing the wind and the waves with 25 knots wind and 3 meters swell, the boat moves a lot and anything that has not been tightly fixed is moving across the boat. With the power of the waves, the incubation tank used to study phytoplankton production, which is located against the rail, finally breaks. 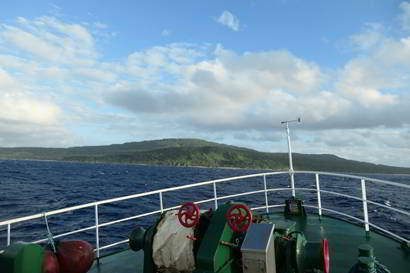 Later in the afternoon, we are happy to see Alofi and Futuna islands. We will stay at anchor sheltered between the 2 islands. We have steamed all night long and went over 2 seamounts (Waterwitch bank and Combe bank) which summit come close to the surface (about 20 m deep). In the morning, we stop on the western side of Combe seamount to start sampling. 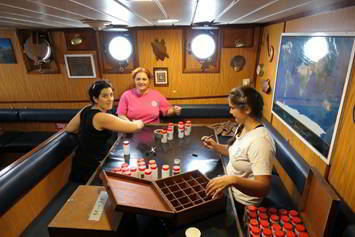 We conduct all the different experiments in about 8h30 and it is a little bit longer than we expected but we decided to conduct a deep trawl at 550m depth, which took nearly 2hours and allowed us to collect hachet fish. Thanks to the 3-stars chef we keep a good morale. Today we were able to make our first complete station. It boosted the morale of the crew. The weather was not too good, so we decided to make a station close to the coast to stay sheltered. 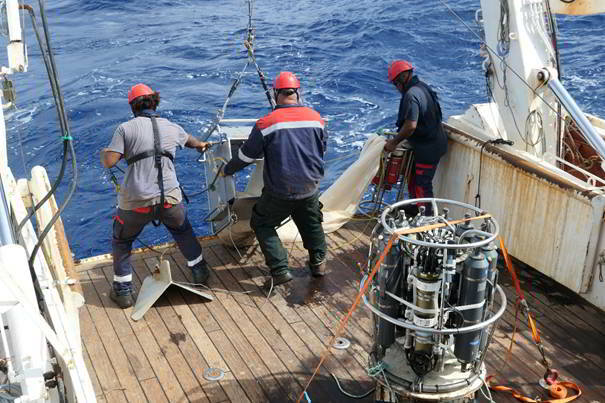 The station started with two CTDs to fetch water at depth. 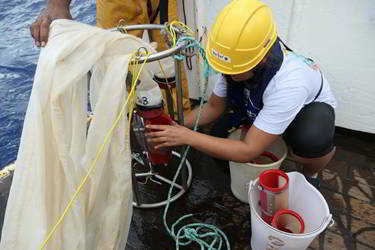 We were then able to make two net tows to look for our first micronekton specimens. We ended up putting the WBAT in the water, the acoustic sounder that goes down to probe the layers. At the time of writing, we are heading north of the area with the objective of passing over a seamount and sampling another one tomorrow. Our first weekend on board looks busy. A group of noddy flying and feeding at the surface near the boat. Launching of the net by the crew members. Tray with specimens captured and sorted in the laboratory for small pictures. 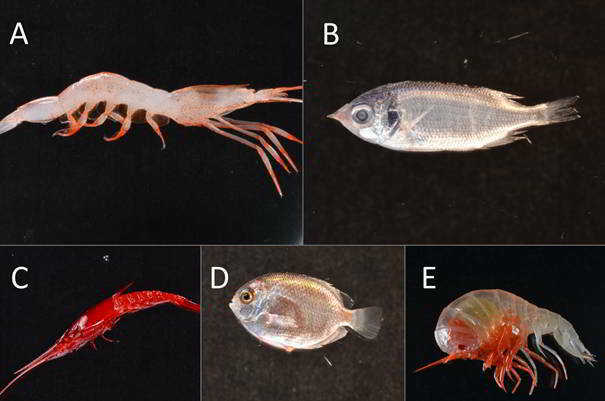 Hatchet fish (top left) with a view from below on their light organs (bottom right). 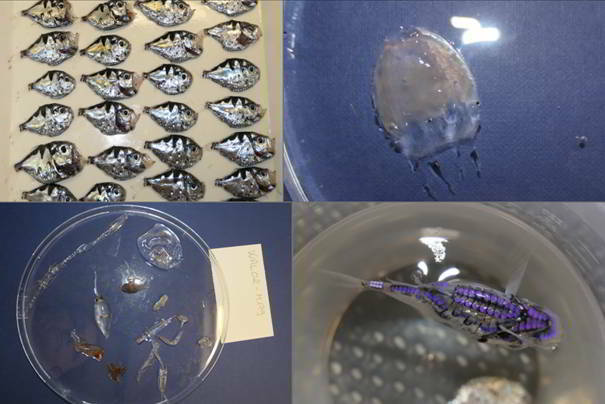 A deadly jellyfish of the Cubozoa family (top right) and some specimens from other groups: crustaceans and mollusks. The pilot arrives onboard around 6:15am and we leave the lagoon through the narrow pass. We head towards our first sampling station that we chose leeward point with the hope of being protected from the swell. We started working at 8:30 with 2 casts of the rosette to establish a 600m vertical profile of temperature and various parameters and to collect water. Two acoustic casts with the TAPS and WBAT and one zooplankton net later the wind has picked up and with 25 knots the captain decides to stop the work. 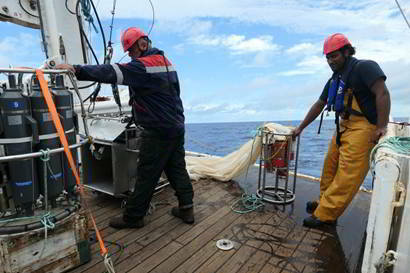 Unfortunately we will not be able to conduct the micronekton net trawls. We cannot go back into the lagoon so we come closer to the island to seek protection and we will wait for the wind to go down before heading towards the next sampling station. We hoped we could leave the lagoon tonight but our departure has been delayed once more as the wind is blowing at 30 knots with 3m waves outside the lagoon. The very last preparation is to put new labels on the vials that will contain the samples. We also work on the sampling plan with less sampling station as we have missed 3 days already, and unfortunately we will not have time to visit the north of the economic zone. We are still anchored behind Nukuatea islet close to the pass. The anchorage is quiet but the wind is still strong and we cannot leave the lagoon; the ocean at the horizon is rough. 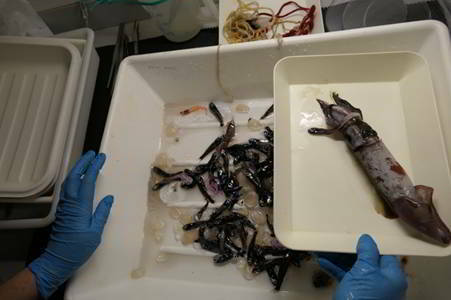 We use this extra day in a quiet environment to work on the acoustic instruments that allow to estimate the small living organisms in the ocean, such as fish. 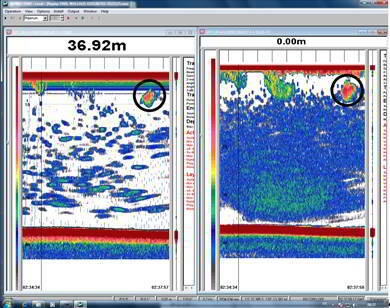 The WBAT is a wide band echosounder and we put it at the back of the vessel to calibrate it. It is a new instrument and we take a few underwater pictures. We also need to install the surface echosounder. A pole has been added on the side of the boat and we will put the sounder at its extremity. The pole is maintained outside the water when steaming and lowered down in the water when we want to measure the acoustic signal at the surface. The echosounder installed under the boat looks towards the bottom and cannot see the upper 7-8 meters, but with the new sounders mounted at the extremity of the pole we can now observe the biomass of small fish from the surface which are consumed by seabirds, among others. We also test the boat’s echosounder and one member of the team dives under the hull, which allows us to observe the acoustic signal of a human being. Those are the last things we are preparing; we really hope to leave the lagoon tomorrow afternoon as the weather is supposed to improve with winds going down to 17 knots. 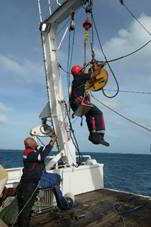 Installing the surface sounder on the pole; lowering down the pole underwater and underwater view of the pole in position to acquire the acoustic signal from the surface. After a long night full of the ship's squeaks and noises against the dock, the decision is made: we leave the wharf. The captain is worry that repeated shocks could damage the hull of the boat. The departure from the wharf is dangerous: the swell pushes the boat against the wharf and it is necessary to avoid that the boat’s rear taps during the rotation. Fortunately the captain and the crew are experienced and the departure is done without any damage. We have finally departed and we are at sea, even if it is not yet offshore and we stay in the lagoon. So we leave towards the other side of the island, sheltered from the swell and the waves by a small islet. This short transit allows us to admire the 100 shades of blue of Wallis lagoon. We anchor and we are a little bit protected from the swell, even if the wind continues to blow. 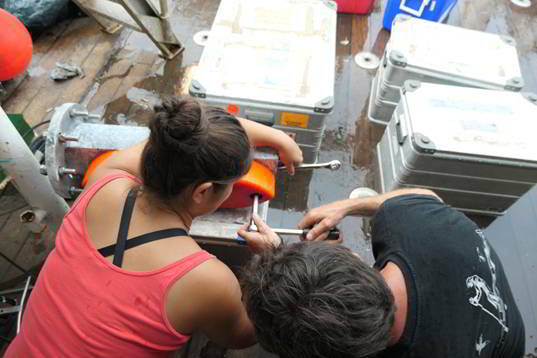 We start by tweaking the settings of the different acoustic devices and adjust the zooplankton net. Then we enjoy the lagoon, a swim at the back of the boat and we use the small zodiac to go on the beach on the nearest islet. A nice walk on the beach allows us to admire the landscapes of a lost corner of paradise. Leaving the dock, the waves pass on the front deck of the boat and it is not easy to detach the boat. However, a shock against the wharf exploded a protective buoy. Before leaving, we must attach everything to make sure it does not move or break. 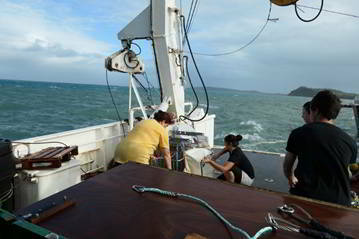 On the right, setting the zooplankton net. Small trip to land to stretch our legs and enjoy these beautiful landscapes. The weather is worse than yesterday. The lagoon is stormy and waves are going over the wharf with wind between 30 and 35 knots and 42 knots gusts. We do not even think to leave, we cannot go through the pass to leave the lagoon and it would not be possible to work outside. We stay along the quay but the vessel is not sheltered and the wind and the swell are sideways. The boat moves a lot, it’s very noisy and it is difficult to sleep. 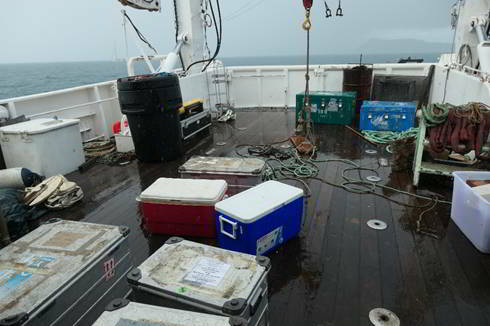 However, we continue to prepare the lab and the instruments inside the boat as much as possible to avoid the rain. But, for some of the equipments we do not have the choice and we have to go outside. Between 2 showers there are also large waves coming overboard and we finish completely wet. The day was though but we are still along the quay. 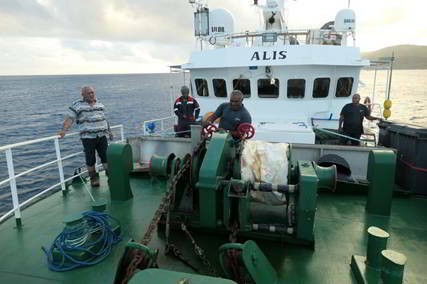 The entire scientific team is now onboard the vessel in Mata’Utu the capital of Wallis. 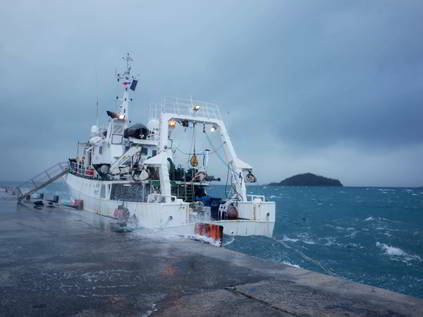 With a terrible weather with strong wind and rain, the boat moves as if it was in the ocean while we are still along the wharf. On Saturday morning, we are meeting with the director of the service of environment and a staff member of the service of agriculture and fisheries of Wallis and Futuna. They have helped us organising the cruise and they are now accompanying us to visit the king of Wallis who will receive us in his palace. We hence have the opportunity to present our project to the king who thanks us for coming to Wallis. He is interested in our project on the tuna environment that reminds him his participation in the 1990s to the MHLC (Multilateral High-Level Conference) process for the development of the tuna commission in the western and central Pacific. We then headed to the Territorial Assembly where 4 representatives, the vice-president of the assembly, the president of the finances commission, the president of the education commission and the president of the agriculture and fisheries commission welcomed us. We present our project and discuss with the representatives on the interest of this study for Wallis and Futuna, particularly in regards to the willingness to develop the tuna fishery in the EEZ. Two television journalists of the Wallis and Futuna 1ère TV followed us this morning to report on our project on Sunday night. We also welcomed onboard 2 professors of the collège and lycée; they will use the information collected for teaching their classes. In the afternoon, we started to organise the lab and to install all the instruments; this year we have a few extra acoustic gears that need to be set up. Towards the end of the day there is still a lot to do to be ready to go, however the weather forecast is very bad and we know we won’t be leaving the following day as previously planned, so we still have some time to get prepared. 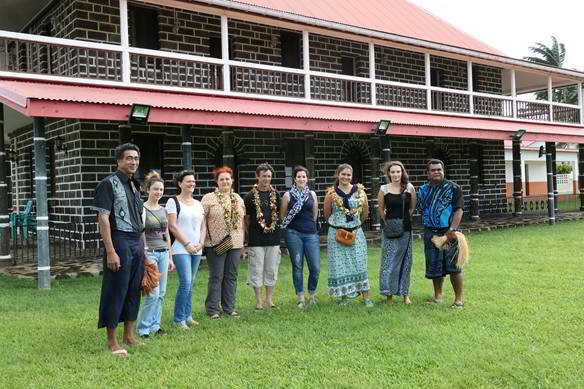 The scientific team with the director of the service of environment and one of his colleagues, and a staff member of the service of agriculture and fisheries from Wallis and Futuna, in front of the palace of the king of Wallis. 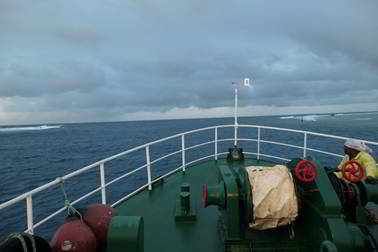 Despite a 20 knots wind that is increasing and some rain, the vessel continues to progress towards Wallis at 8 knots. It is now located 68 nautical miles in the north of VANUA LEVU (Fiji). 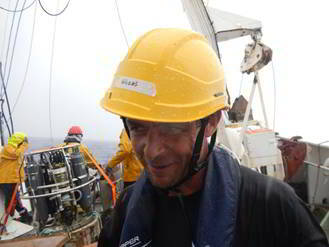 During the transit the crew keeps active and prepares the equipment for the voyage. This morning the cable of the oceano winch, which is several hundred meters long, has been unwound and rewound carefully to avoid any problem when using it with instruments. This metallic cable contains an electronic cable which is connected to the instrument at the extremity of the cable and which allow to send instructions to the instrument from the dry lab such as closing the bottles of the rosette to collect sample water at chosen depths. 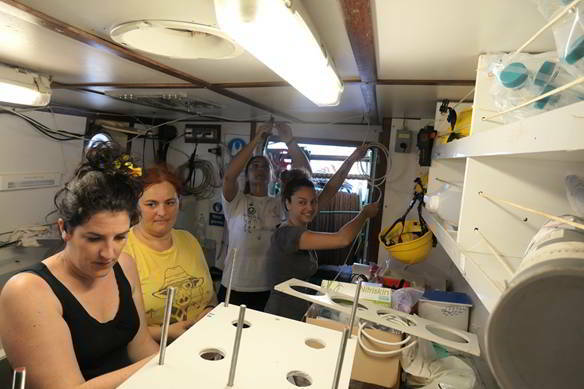 The six scientist are still all over the world with four staff in New Caledonia, one in France and one in French Polynesia, and getting prepared for the cruise but in the meantime the vessel is progressing. The captain informed us today that around 5pm they were located north-west of Viti Levu island in Fiji waters. They expect to arrive in Wallis on the 28th of June. It is almost dark, around 5pm, when the RV Alis leaves Noumea harbour. The crew is composed of 12 members: the captain, the chief officer and the second officer are at the deck to supervise the navigation, the chief engineer, the second and the third engineers take care of the engine, the chief cook and the steward make sure to maintain a high morale among the crew members, and four seamen including a bosun who will execute all the necessary manoeuvres onboard. It will take them several days to convey the vessel to Mata Utu the capital of Wallis. 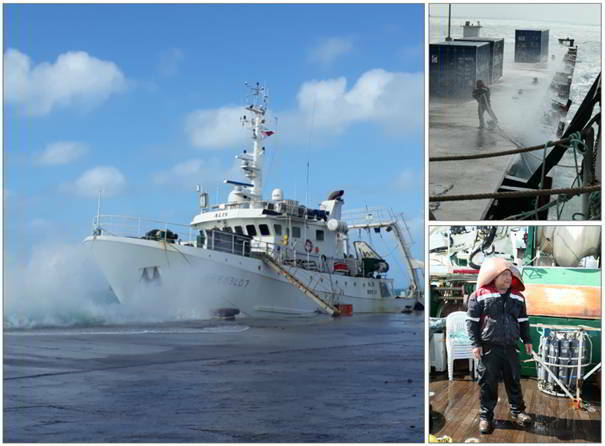 The Wallalis voyage sill only start on 1st of July, however we had to load all the equipment onboard today in Noumea, the home port of the vessel. The vessel will leave Noumea tomorrow and it will take 5-6 days probably to reach Wallis depending on weather condition. We are loading a lot of equipment and particularly the large micronekton net that will allow us to collect the small fish and squids that are eaten by tuna. We will also use a number of acoustic sounders that require electronic installation work. 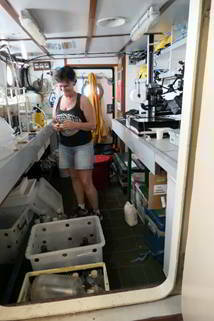 The small lab is full of boxes of equipment that we need to securely fasten so nothing moves during the transit voyage to Wallis that might be rocky considering that the vessel will navigate sideways to the swell. After 6 cruises conducted in the exclusive economic zone of New Caledonia between 2011 and 2017, we will be leaving those waters to go and explore the waters of Wallis and Futuna. 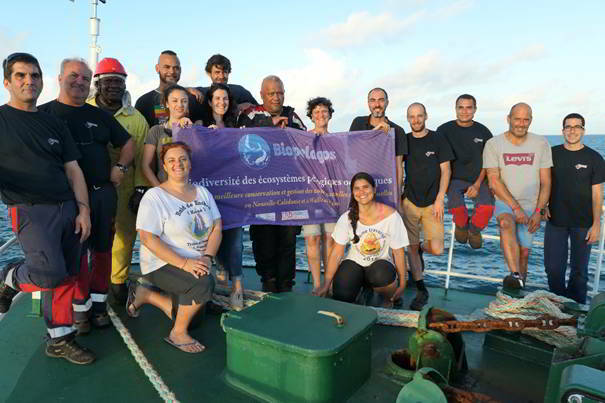 In the framework of the Biopelagos project (funded by BEST 2.0, European Union), SPC and IRD continue collaborating to better understand the ocean, its functioning and its inhabitants. We cannot wait to discover waters around Wallis and Futuna that are mostly unexplored and for which, to our knowledge, there is no information on micronekton (small fish, squids, crustaceans, jellyfish measuring between 2 and 20 cm and consumed by tuna). 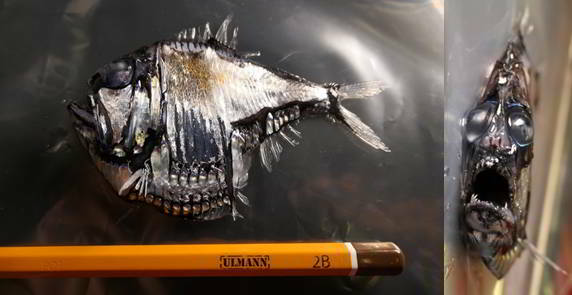 Characterising the ocean around Wallis and Futuna will allow us to better understand its functioning and might allow to identify hotspots of biodiversity that could be protected, particularly around seamounts, or to identify areas where the micronecton is more dense and where top predators such as tuna, marlins or seabirds could come and feed. 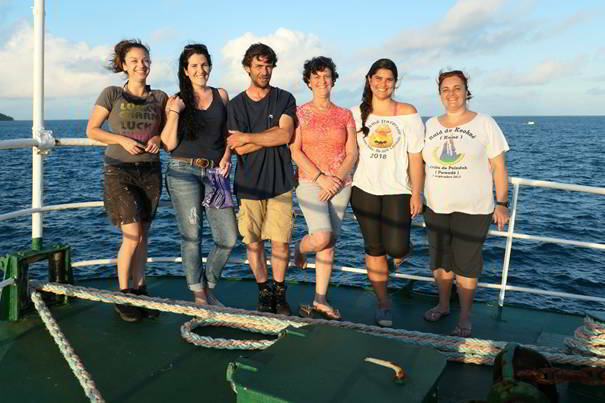 The Wallalis voyage is starting on the 1st of July from Mata’Utu in Wallis and a team of 6 scientists from IRD and SPC will get onboard for 2 weeks with a stop in Futuna on the 9th of July, and coming back on the 16th of July. 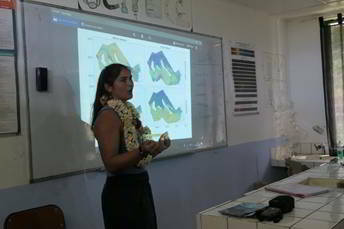 In Wallis and in Futuna we will meet students from several schools to explain them our work and exchanges ideas, and we will also meet all the stakeholders interested in the project.